A rendering of DK Sushi, soon to open at UPenn. Michael Schulson and Nina Tinari Schulson are set to open a spin-off of Midtown Village's Double Knot in the University of Pennsylvania’s remodeled food hall at 34th and Walnut streets within the next few months. In case you're not familiar, Double Knot is an all-day cafe with a speakeasy-style sushi bar and izakaya in the basement. The menu includes sushi, sashimi and robatayaki. 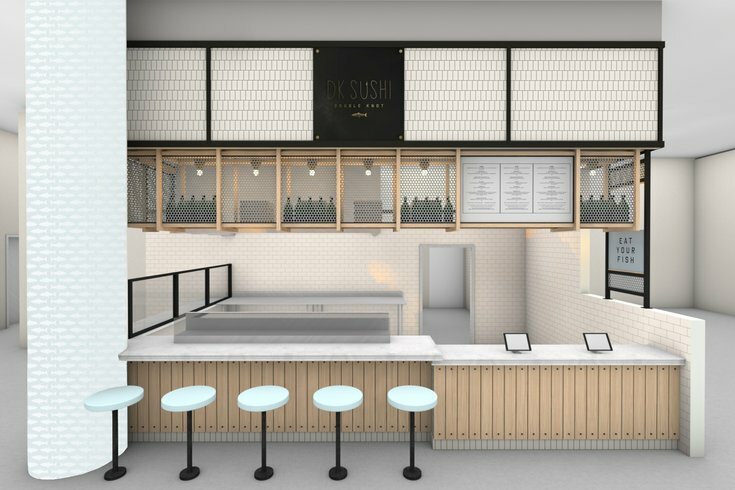 UPenn's new "fine-casual" DK Sushi will be helmed by Double Knot’s chef Kevin Yanaga, who will create a menu of à la carte items and signature sushi sets that will be made to order. Guests will make selections from touch-screen kiosks. DK Sushi will be available to-go and via delivery. Guests can build their own sushi boxes by mixing and matching à la carte sushi and sashimi pieces ($4 to $9 per item), or can grab a signature box arranged by Yanaga ($16-$34 per box). There will also be an option to sit at the eight-seat chef's counter to participate in chef Yanaga's daily multi-course omakase. At the chef's table, Yanaga will present 12 to 14 dishes, depending upon what fresh pairings he's inspired to create that day. The price will be between $40 and $50. DK Sushi's exact opening date has not yet been announced.